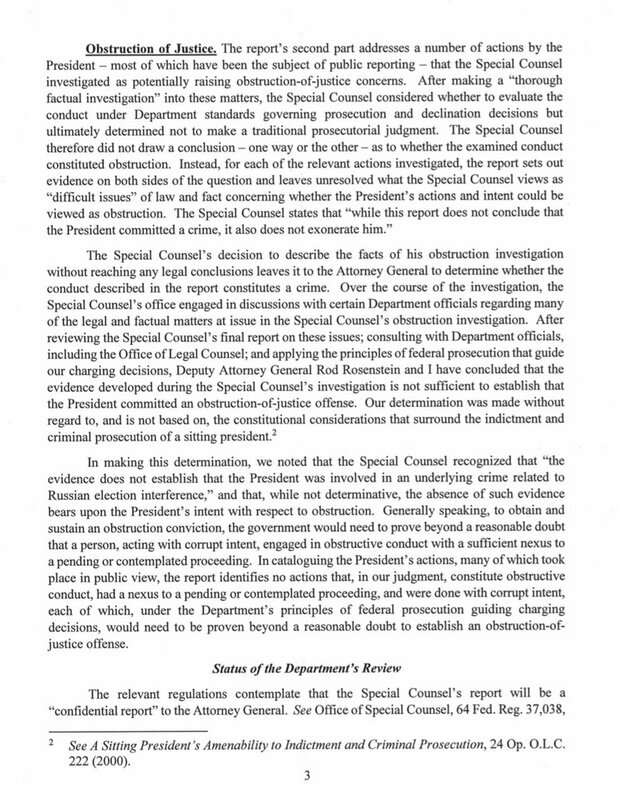 Thread by @Teri_Kanefield: "(Thread) Here's the full text of Barr's summary. 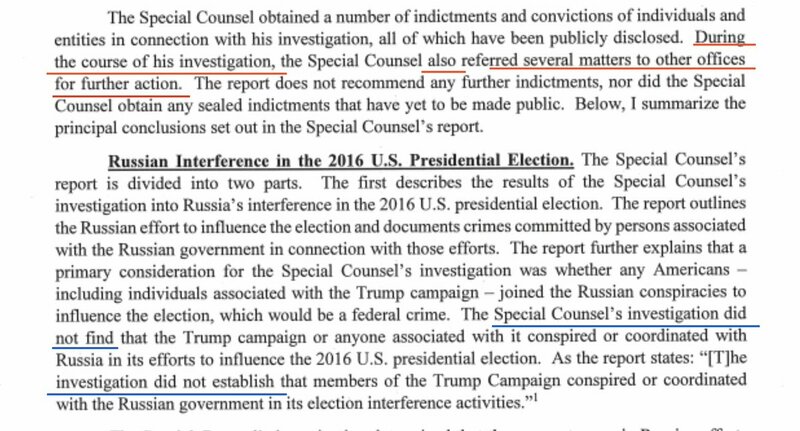 From P. 2: "The investigation did not establish that members of the Trump campaign conspire […]"
3/ Rosenstein and other DOJ officials decided not to prosecute obstruction of justice after "applying the principles of federal prosecution that guide our charging decisions." This was partly because evidence didn't establish that he committed an underlying crime related . . .
4/ . . to the Russian election interference (which goes to motive to obstruct). 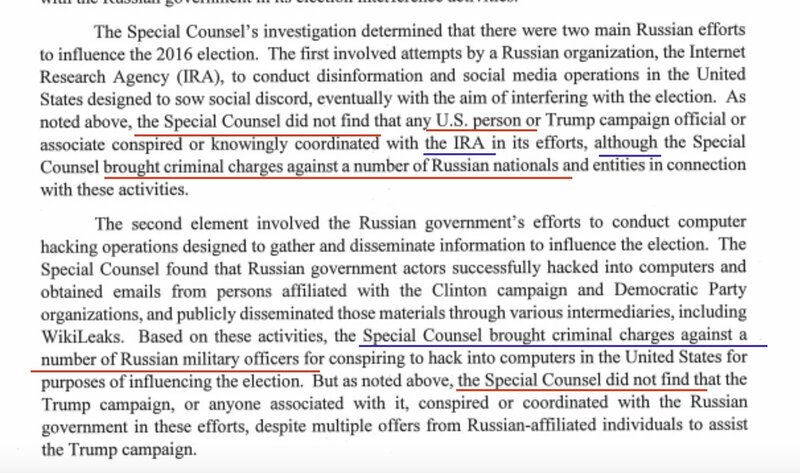 Yes, this is Barr's summary. Basically, what Barr is saying is that (in his view) there's isn't proof beyond a reasonable doubt. SC declined to reach a conclusion. 5/ Yes, Apex, that's what he's saying. As a matter of law, this is wrong. As a practical matter, if indeed a Trump-Russia conspiracy can't be proven, Trump's defense would be that he wanted to shut it down because he knew he committed no crime . . .
6/ . . . this is not a legal defense. But it might work in the Court of Public Opinion. I need to think about this, but my off-the-cuff comment is that SC specifically said he did not exonerate Trump. That came from Barr. . .
7/ . . . this does not preclude Congress from stepping in, demanding to see the evidence, and reaching a different conclusion. That's why we have more than one branch of government. It keeps the executive branch. . .
8/ . . . from exonerating the head of the executive branch. Congress makes the decision about whether the president committed impeachable crimes. I expect that the House will now demand the full report & evidence, conduct its own investigation, and reach its own conclusion. Yesterday I explained why, given the the constitution lays out a procedure for finding a sitting president guilty of criminal or impeachable conduct, it made sense to me that Mueller would not indict Trump. . .
10/ . . . even though the legal scholars agree that a president can be indicted. The Constitution gives the power to indict (impeach) and find guilt (remove) to Congress. This is why Barr and Rosenstein's assessment is not binding on Congress. 11/ I've also talked about the fact that prosecutors have a very high conviction rate (better than 90%) because they don't bring cases unless they are confident they can have evidence to convict beyond a reasonable doubt. 12/ This disclaimer cuts both ways. Not indicting (or impeaching, which is equivalent) does not necessarily mean a person is innocent. Some crimes (like bribery which requires quid pro quo) are hard to prove. Others, like conspiracy, are much easier. Thread: Don’t Believe the Democrat and Media Spin on the Mueller Report! 3. Elected Democrats like Schiff, Swalwell, Lieu, Blumenthal, Cummings, Nadler, and a host of others have INSISTED multiple times in public statements and television interviews that there was a “mountain of evidence proving Trump was a traitor” and/or a Putin puppet. That's how much of the 1,670-word Barr Letter was taken verbatim from the Mueller Report -- or about 6% of the total. The other 94% is either Barr's analysis or explanatory throat-clearing. There are only eight instances where Barr quotes directly from the Mueller Report. Quotes in ALL CAPS. 1. 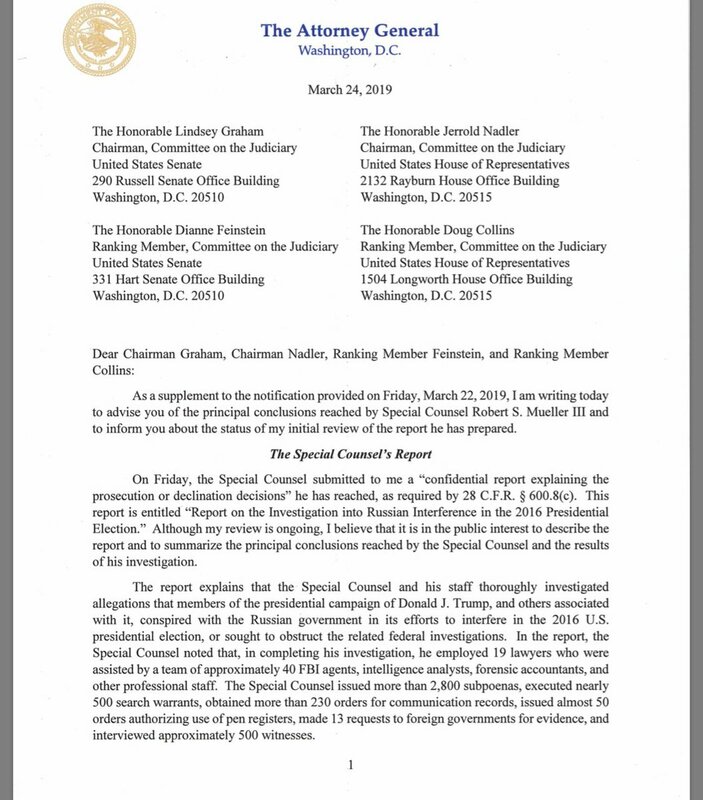 On Friday, the Special Counsel submitted to me a “CONFIDENTIAL REPORT EXPLAINING THE PROSECUTION OR DECLINATION DECISIONS” he has reached, as required by 28 C.F.R. 600.8(c). If one wanted to advise of the report’s “principal conclusions,” one would expect that more of the “principal conclusions” actually be shared. This is merely a thought but YOLO. 2. 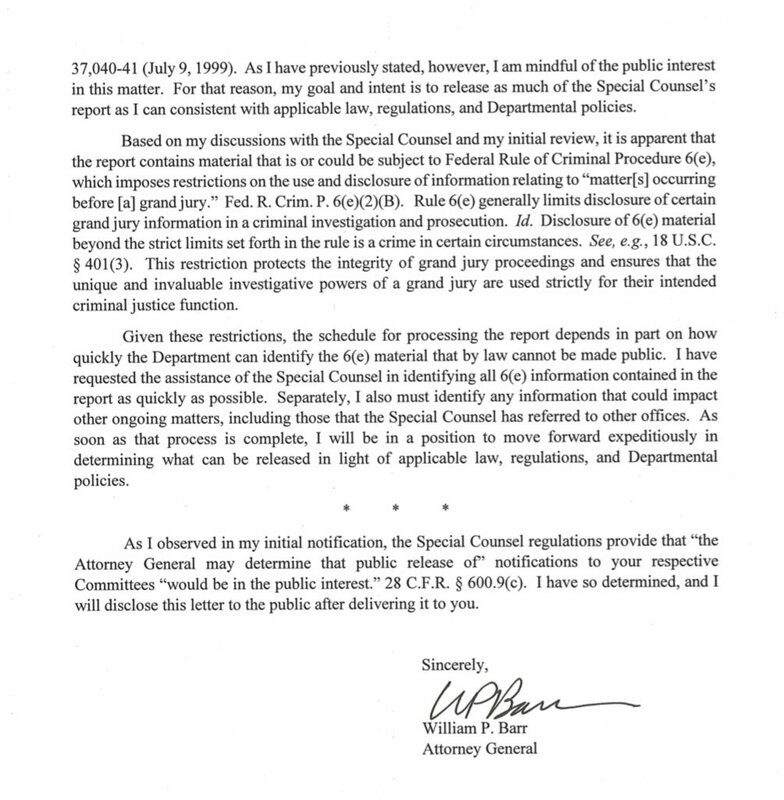 Barr's letter clearly says, "During the course of his investigation Mueller referred matters to other offices for FURTHER ACTION." OK. To normal US prosecutorial offices. 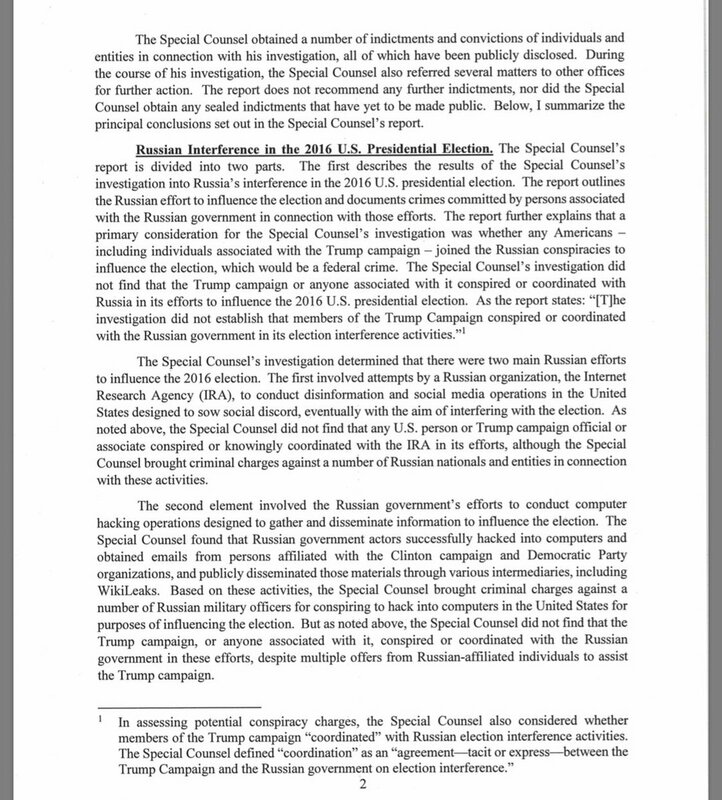 Next, Barr describes the crimes, and says Mueller indicted only Russians for them. What if...... that is simply because those matters are crimes, crimes that need convictions to assert guilt? 2/ The letter raises many questions and is *not* the full report. But it does tell us many things that are very important. First, it sets forth the sheer amount of work that went into the Mueller investigation. He issued 2,800 subpoenas and interviewed 500 witnesses.